My summer intern, Melanie Jensen (now a senior studying horticulture at Southern Illinois University), has always wondered how botanic gardens put together their impressive seasonal displays. In fact, she was so intrigued by them that she did her final presentation—a graduation requirement for the Garden’s horticulture internship program—on the complexities and challenges of preparing these displays. To say the work is complex and challenging is almost an understatement. Sometimes our work here seems like magic. Overnight, the Garden can transform from spring to summer or summer to fall. Yesterday there were spring troughs, summer palm trees, or fall mum towers in the Garden. Today, there is something completely different. Yes, it does seem like it happens just like that, perhaps with the snap of a finger. But behind the scenes, for months or even years before most visitors get to see a display, a team is already hard at work making it happen. Melanie and more than 50 other staff and volunteers had a front row seat this summer to help me create this fall’s signature display in the Heritage Garden—the Viola pyramids, which are now on display. The pyramids themselves are really just a set of simple flowers presented in a very unique way. The story could end right there, but what I think makes this display fascinating to people like me and Melanie (and hopefully to you, too) is the astonishing amount of work it takes to get the pyramids from concept to finished product. 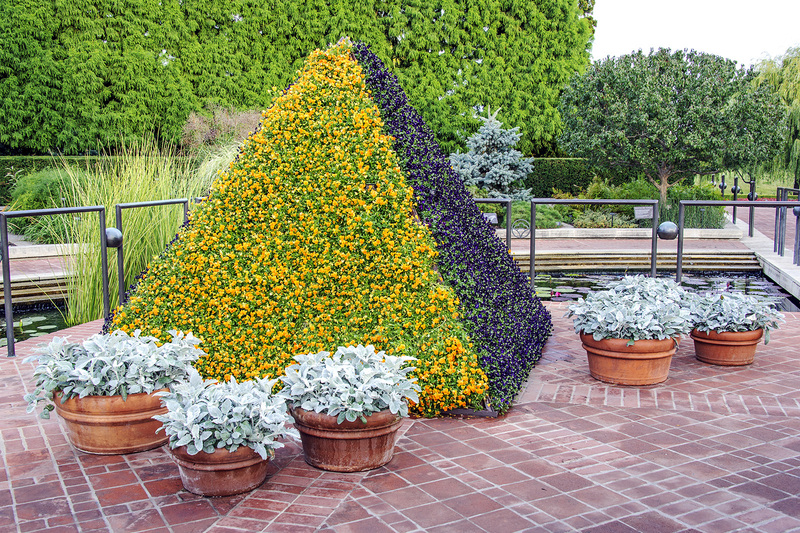 The Garden began working on this project more than a year ago, when outdoor floriculturist Tim Pollak and I were brainstorming on how we could use the pyramids in another display. Last used about five years ago, the pyramids have traditionally been used as a summer display component, planted with two cultivars of Alternanthera. Pressed to take a fresh approach to the pyramids, we settled on the idea that they would make a great fall display. We considered using mums (too fragile, and many growing challenges) and Verbena (not frost-tolerant enough for fall), and concluded that Viola were our best option. Others agreed. Saying we are creating Viola pyramids is the easy part. Actually doing it is a completely different story, and it’s a testament to great project planning and teamwork at the Garden. 4. Most of the time we will water the pyramids with a hose and water nozzle, but sometimes we need to give them a deeper soaking, especially on hot and sunny days. To help with that, we weaved soaker hoses throughout the frame so that we could water from the inside out. 5. 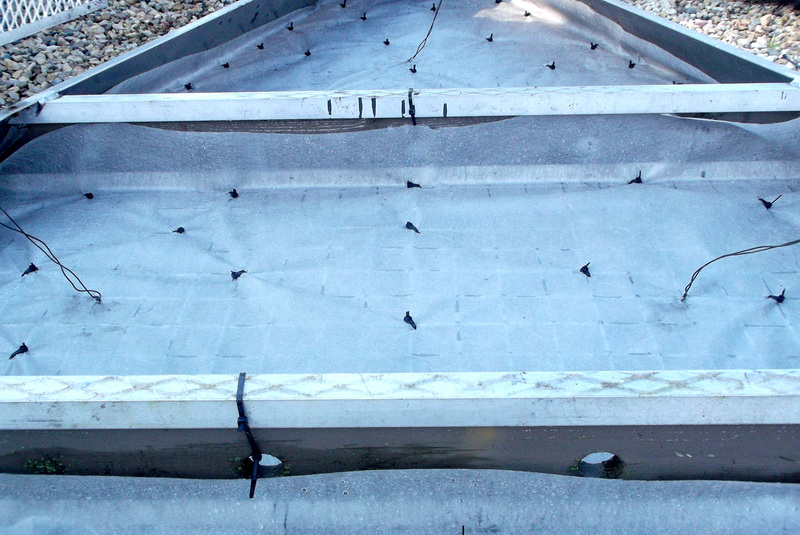 To make the pyramids lighter (each individual panel weighs about 500 pounds—meaning each pyramid weighs 2,000 pounds), and to reduce the amount of soil and perlite needed, we stuffed sheets of foam insulation into the bottom of the frame. 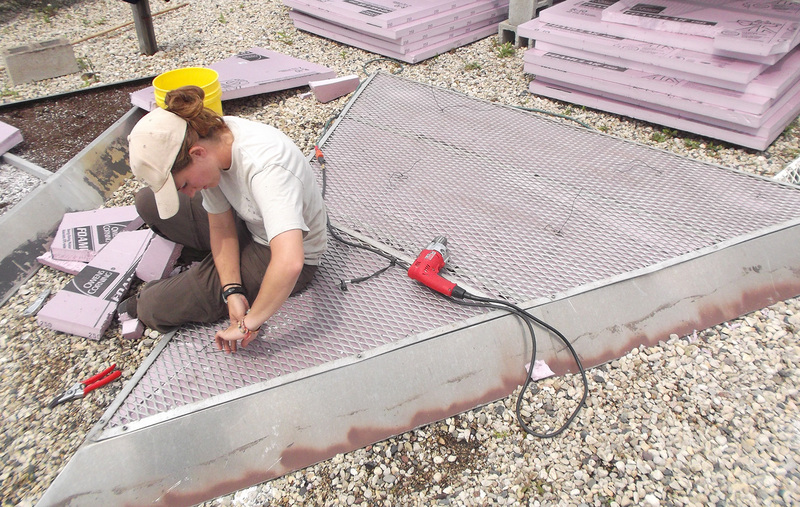 A mesh screen secured all of these materials inside the frame. 6. Time to plant! 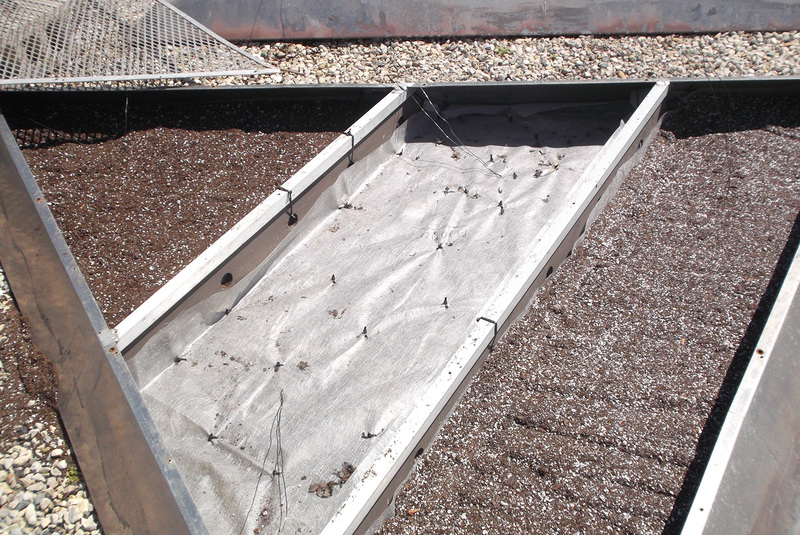 We cut tiny holes into the landscape fabric and inserted a Viola plant. 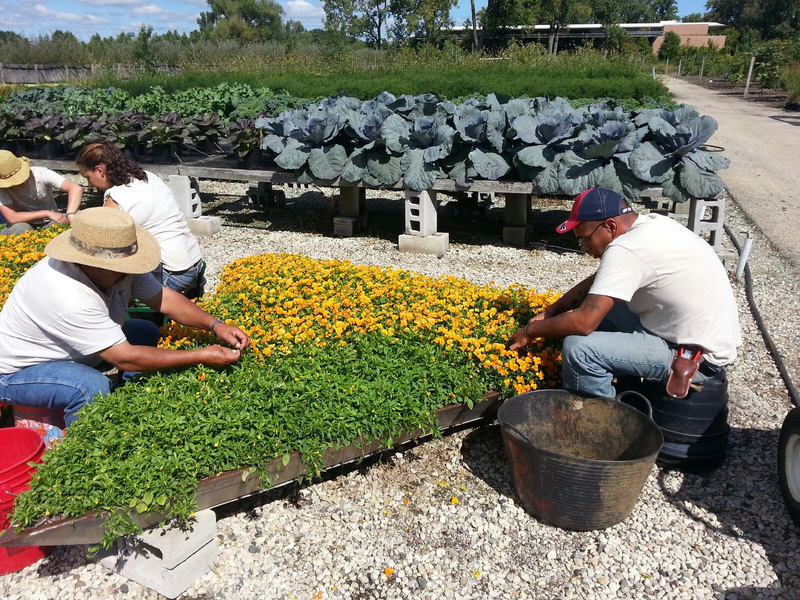 As we planted, we also pinched and deadheaded each and every Viola. 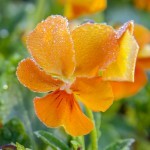 During the critical first few weeks of growing in the pyramids, the Viola plants need to spend their energy developing roots and spreading foliage to cover the entire frame, rather than producing flowers. Removing all of the flowers is a hard thing to swallow, but it’s really for the best long-term interest of the display. 7. 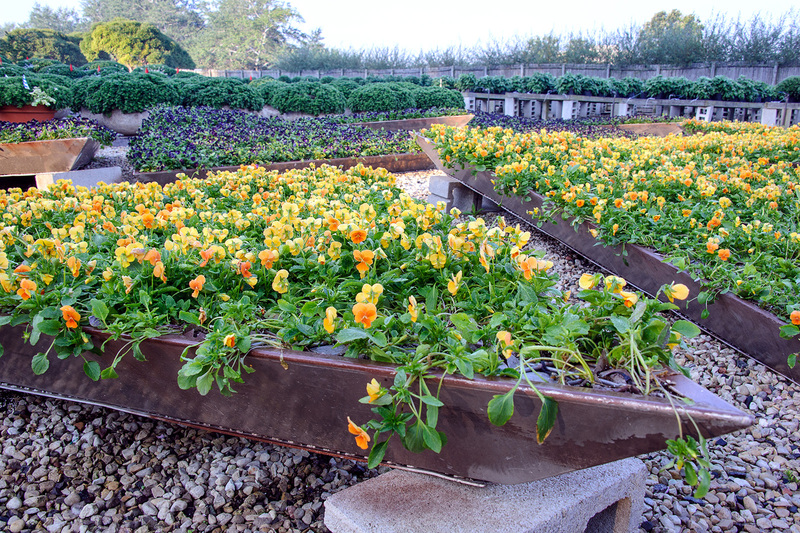 The original plan was to leave the Viola plants simply to grow as-is under the care of our great production team until they were display-ready in mid-September. However, Mother Nature had other plans. The weather caused the Viola to grow faster than expected, and by late August it became clear that we would need to do another round of deadheading. Staff and volunteers again converged in the nursery for two days of meticulous work removing every flower head and seedpod from the display. It was a lot of work, and a little disconcerting to again make a beautifully colorful pyramid all green and flowerless, but it was an important task so the Viola could flower prolifically later into the season. 8. Time to move to the Heritage Garden! 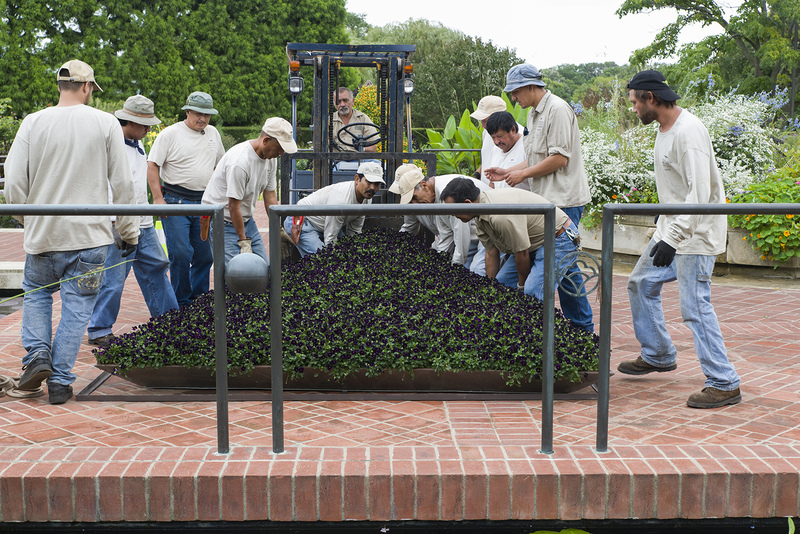 It took 15 strong groundskeepers, some extra machinery and ropes, a lot of creative thinking, and 1½ days of hard work to move the pyramids from the Nursery to the Heritage Garden. Come by and take a look! I often like to break down the numbers for a project, because it articulates the scope of work in a way that words cannot. So, here are some numbers for this project: Over one year of planning, more than 50 people involved, 6,400 plants used, and more than 500 hours of labor to get the job done. Yes, 500 hours! It seems like a lot of work—and it is—but I hope that everyone who sees the display takes away something uniquely personal to them. Perhaps it sparks your creativity on how to use simple plants in unique ways. Maybe seeing something new and special triggers your passion for plants and horticulture, either as a hobby or as a career. Sometimes the display will draw your attention to a part of the Garden that you never explored before now. Or maybe you like it just because it looks pretty cool. It’s even O.K. if this display just isn’t your thing: artistic choices are very personal. Whatever your take-away is, however, my hope is that we can use this display and others like it to engage you in a conversation about plants and to help you connect to the Garden in an exciting new way. That makes 500 hours of work worth it for me. 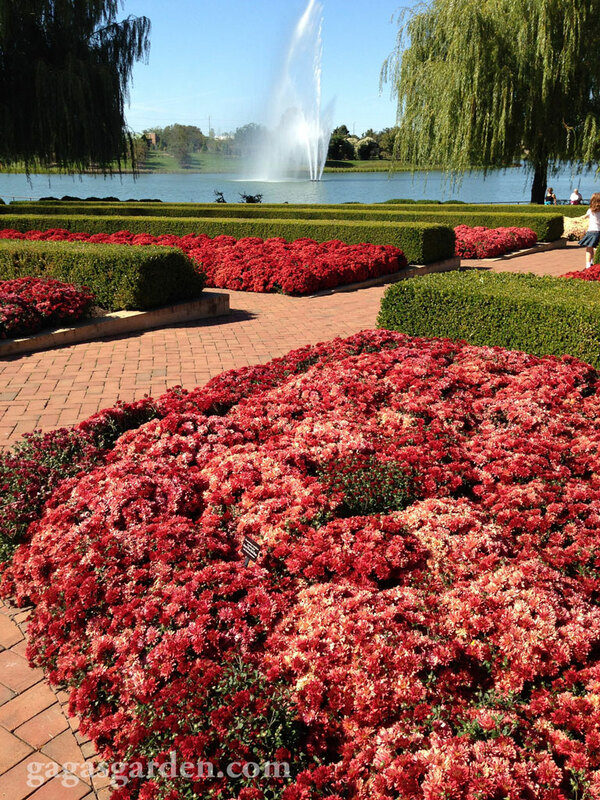 Tom Soulsby is a senior horticulturist at the Chicago Botanic Garden and is directly responsible for the Krasberg Rose and Heritage Gardens, as well as the Linden Allee. He also supervises several other Garden areas. 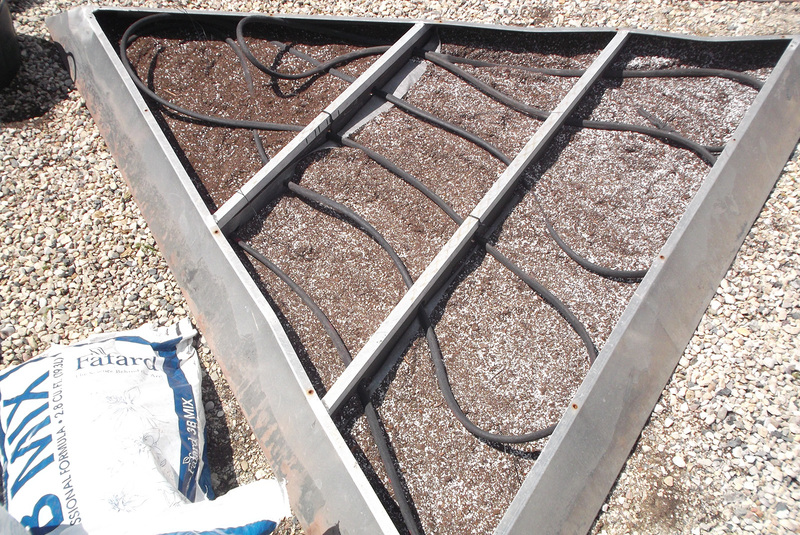 Tom also performs landscape and design work for private businesses and residences throughout the Chicago area. Prior to pursuing his lifelong passion and sharing his love for gardening with others, Tom was a successful business professional with nearly 20 years of corporate and small business experience. Tom holds a B.S. in Business Management and Administration from Bradley University. He is also a graduate of the Joseph Regenstein, Jr. School of the Chicago Botanic Garden, where he received his formal horticulture education.